During the late 20th Century thousands of Americans left farms, families and friends to trek the Oregon Trail toward new lives in the West. 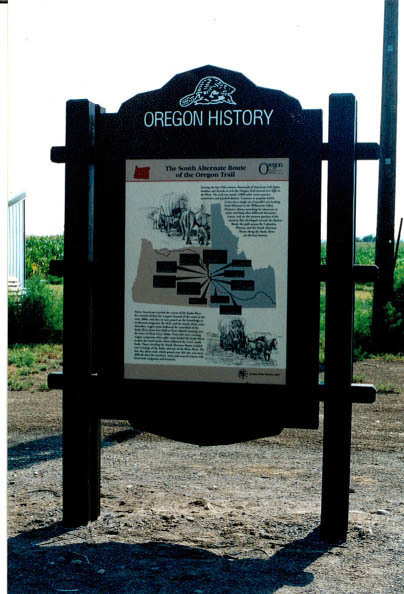 The trail was nearly 2,000 miles across prairies, mountains and parched deserts, and contrary to popular belief, it was not a single set of parallel ruts leading from Missouri to the Willamette Valley. Pioneers, always searching for shortcuts or easier traveling often followed alternative routes, and on the western portion of the journey they developed several: the Barlow Road, the path across the Columbia Plateau, and the South Alternate Route along the Snake River are the best known. Native Americans traveled the course of the Snake River for centuries before fur trappers learned of the route in the early 1800s, and they in turn passed on the knowledge to westbound emigrants. By 1843, and for nearly thirty years thereafter, wagon trains followed the watershed of the Snake River from Fort Hall to Three Island Crossing near the town of Glenns Ferry, Idaho. From this river crossing wagon companies often split: Some forded the Snake River to gain the north bank; others followed the river’s south bank. Those traveling the South Alternate Route avoided two crossings of the Snake and one of the Boise River. The hot, dry and dusty trail, which passed near this site, was more difficult than the northern route and exacted a heavy toll from both emigrants and livestock.